In the context of ”Linnaeus as a physician” it is necessary also to draw attention to another prominent figure of the day – Nils Rosén. He too was a protégé of Professor Stobaeus. Rosén was abroad when Linnaeus arrived in Uppsala. When Rudbeck was granted a leave of absence, Rosén was appointed adjunctus medicinae, and was to take up his duties as soon as he returned from his stay abroad. 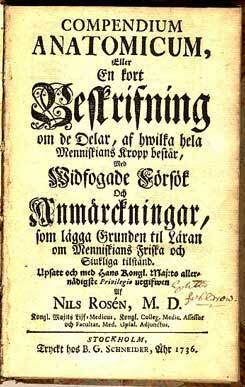 Rosén wrote a number of textbooks: Compendium anatomicum came out in 1736-37. The book Hus- och Reseapotheque (Apothecary for home and travel) appeared in 1765. Source: Compendium anatomicum: image from the 1736 original. Hus- och Reseapotheque: Facsimile edition, 1970, Bokförlaget Rediviva. Relations between Linnaeus and Rosén have been described as being occasionally strained. Rosén is seen as having conspired to obstruct Linnaeus’ career. His motive may have been the competition to succeed Rudbeck. Rosén returned from his sojourn abroad in 1731 and taught anatomy and practical medicine to satisfied students. He was generally known to be skilled in practical medicine and botany. 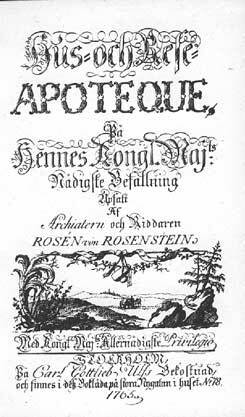 Medical instruction in anatomy and botany was done by Rosén, according to the catalogue, whereas Professor Roberg was supposed to lecture on physiology, characteres morborum, and chemistry. Roberg was old and feeble, so Rosén had taken over this teaching as well. The problem of the inferior instruction carried out by the elderly professors Rudbeck and Roberg was ultimately solved. Rudbeck died suddenly on March 23, 1740, and after some prodding from the Chancellor, Roberg was persuaded to retire. Thereby the professorships in botany, anatomy, and other subjects fell vacant.